Spring is really showing up around here. With the change of the seasons, comes birth, growth, and a time to refresh some chores that are usually only done once or twice a year. 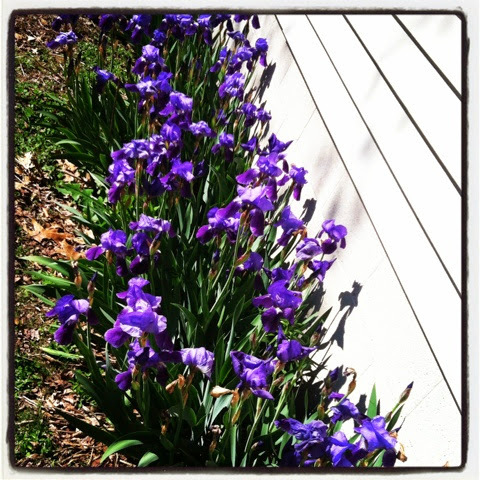 My Nannie Red's irises are blooming along the side of the house. They are so beautiful and they are such a deep purple, truly reminding me of her... Purple was her favorite color. 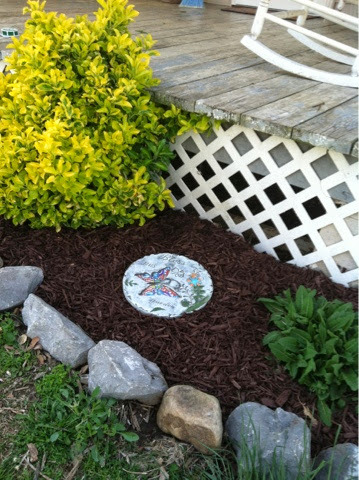 The task of cleaning up the front flower beds is always a chore to be done when spring shows up. Pulling out stubborn weeds that actually made it through the weed barrier and laying down another layer of barrier and a thick layer of mulch. It looks so nice when it is finished! I don't know if it is the same where you are, but our closest Lowe's has mulch for $2 a bag. Next on tap will be cleaning out the deep litter in the chicken house. We let it build through the fall/winter as it creates a heat to help keep the house a bit warmer for the hens. Because we layer the shavings, the poo actually breaks down through the winter. Composting while in the coop. That way when spring comes along with nice weather, we clean it out and it is ready for use! The garden clean-up is beginning (well, not today... it's raining). I have big plans about rearranging the garden beds. Putting down a MUCH stronger weed barrier under the beds and putting the beds closer together so they are more uniform. I also want to move things around a little so I also have a garden spot to plant directly in the ground this year. We will try to get as much done as we can, in hopes to get as much yield as we can from the garden. We are excited and hoping to add some new animals to the homestead in the coming weeks/months. I will let you know if it pans out. I'd hate to say they are coming and then it not happen... but it's something I'm hoping for!